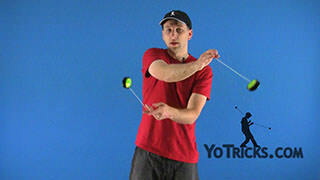 Learn how to do a fundamental 2A wrap, the Long Spin Butterfly Wrap. Just like that. 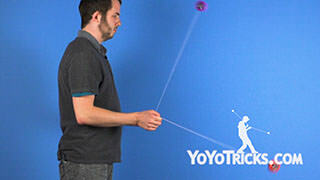 So a trick that we suggest learning before this one is called the two handed butterfly. 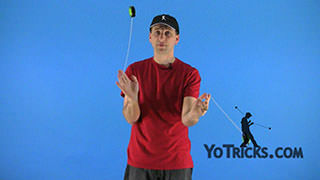 It is not completely necessary to know the trick in order to learn this wrap concept, though it does help with the coordination of the trick, so we highly suggest going to our video section on our website and checking out the trick two handed butterfly. 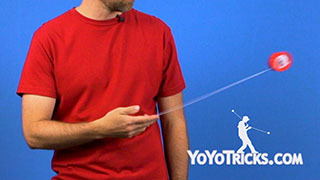 To start with this wrap trick we are going to learn what our yoyo hand does during the wrap and not even throw the other one to star off. 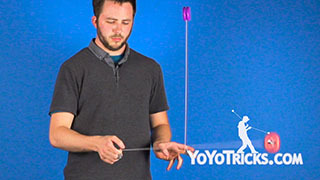 We are going to throw a breakway over top of our opposite hand and then over top of the index finger of our yoyo hand and stop it at the bottom as though we are setting ourselves up for a 1.5 mount in 1A. After you stop the motion at the bottom here you are then going to push back up with your yoyo hand to undo and dismount the wrap back the way you came. 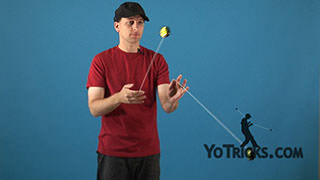 After you dismount out of the wrap you will notice that when I catch it, I am catching it with my palm down and that has to do with the spin of the yoyo. Normally when the yoyo swings out it feels like you should be catching it with your palm up here when it swings around, and that has to do with when it is spinning and you do have to catch it palm up, the yoyo is spinning in this direction when you catch it from a forward pass, but then when you come out of the wrap here, you are actually having the yoyo spin in this direction opposite of what a forward pass would be and that is why you catch it with your palm down. 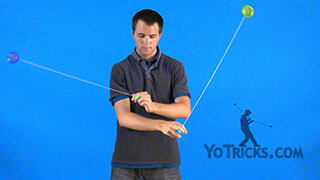 This is an important concept to know is knowing which way the yoyo is spinning at all times in 2A because if you throw a sleeper, the yoyo is going to be spinning in this direction and if you throw a sleeper and then go into an around the world, the around the world is going in the opposite direction of the sleeper that time. 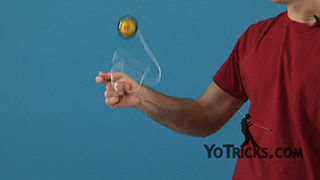 But if I throw a forward pass then the forward pass into the around the world will have the yoyo be spinning in the same direction that it is orbiting around my hand. 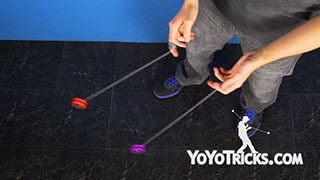 That is two important concepts, so when you throw into a forward pass and the two spins are agreeing with each other, that is same-spin, and when they are disagreeing with each other that is anti-spin. 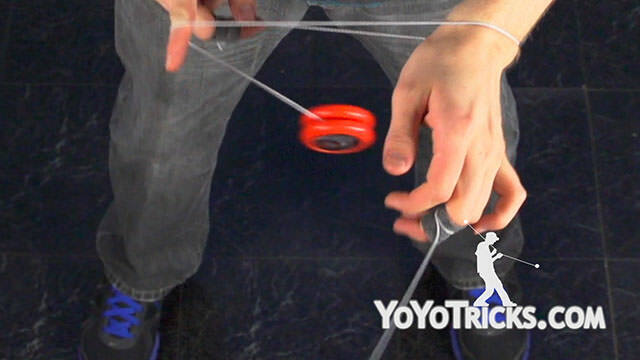 So whenever you are in same-spin or anti-spin it is important to be able to feel out the difference in how stable each of those two are. 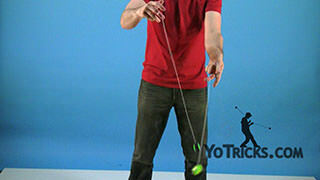 When you are in same-spin, it is more natural and it just feels a lot easier to hit the trick. 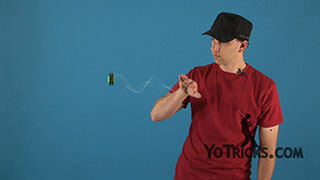 When you are in anti-spin, it is really hard to keep the yoyo in line and to keep it from fluttering out and behaving strangely and having it go out of control like it did there. 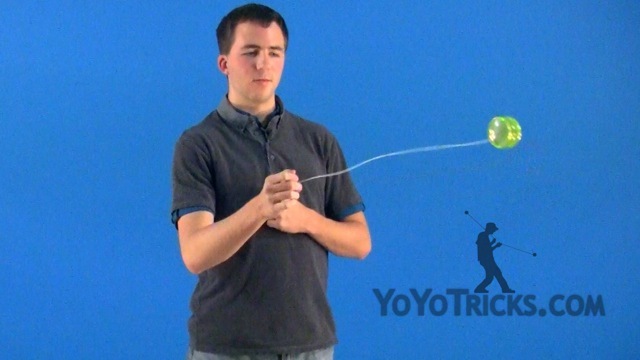 So whenever you are in anti-spin, you just really want to make sure that the yoyo is not touching either side with the string, or else when you are in anti-spin it is just going to flutter out. So that is an important thing to note when you are doing the dismount. 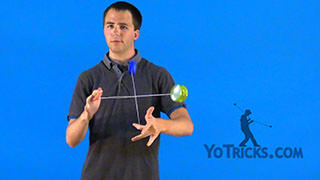 When you are going into it, you are in same-spin, but as soon as you push the yoyo out, you are making the yoyo orbit your hand in the opposite direction, and so the dismount is an anti-spin. 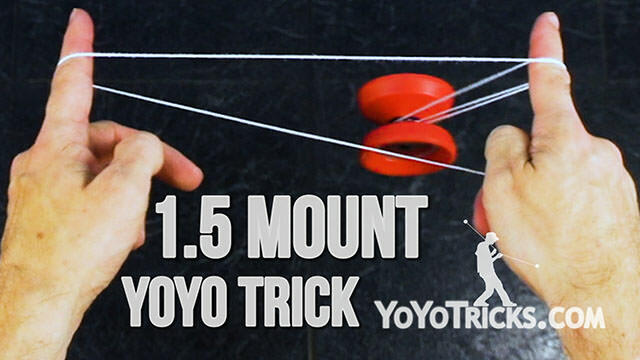 So it will be very apparent once you are doing the dismount that this yoyo will flutter out at the bottom here a lot, so in order to master the trick you want to make sure that you are always catching with the yoyo completely straight up and down. Once you have learned that, you can then combine everything together. 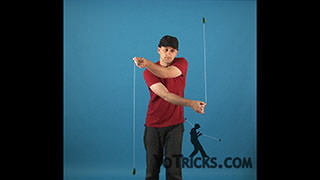 So we are going to throw two breakaways at the same time in order to do the whole wrap trick. 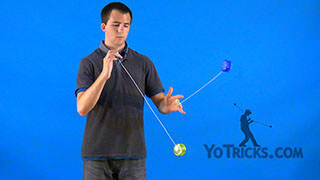 In order to make sure that things work, you want to have your opposite hand in front of your yoyo hand on a different plane, so that way the strings will not cross together and tangle at all. 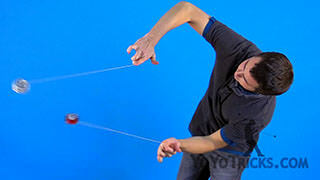 You want to make sure that during the entire wrap, that everything stays on the same plane, because if one plane goes in front of another then that is when strings tangle and that is when the trick just does not look as good. 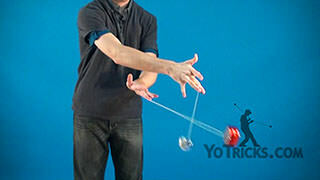 So after you have gotten the idea of different planes down, you have to think about the rhythm and timing of the trick. 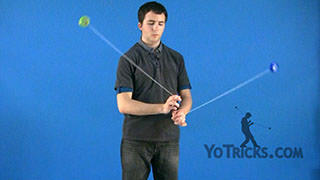 That will be when you throw a breakaway you are going to be doing two around the worlds and catching. 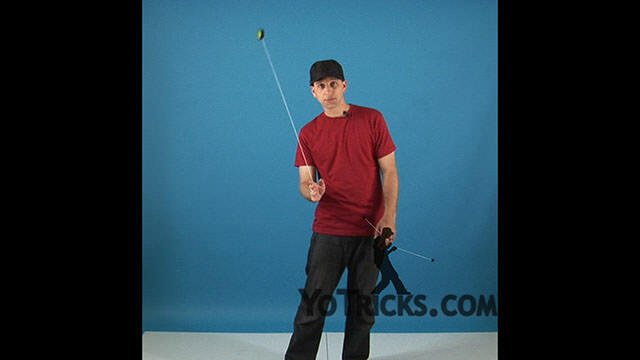 When you catch with the palm up on your opposite hand, that is when you are also going to be catching palm down with your yoyo hand, at the same time on the catch, like so. 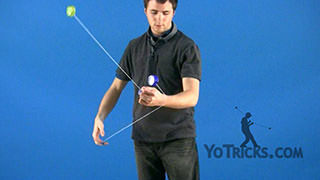 After you have learned that, you can then try some variations on this trick, so an example of that would be doing some butterflies into the wrap, doing some pinwheels while you are in the wrap, and even doing it over your other wrist, and then trying those variations on your other wrist as well. 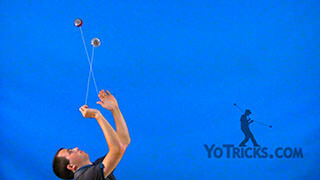 After you have learned all of these concepts and these variations, you have then mastered the Two Handed Long Spin Butterfly Wrap.